West of the Schuykill River. South of Market (soma!). Nestled between Spruce and Walnut is Locust Walk - the heart & soul of the Penn Campus; and here rests St. Mary's Hamilton Village, the home of the Gatherings Concert Series. The champagne-colored Arcturus, positioned for spring, is 37 light years away, but directly above. This was simply a lovely May evening, with friends among friends sharing a special event, building a strengthening community. This would be the night of Gatherings event #-62; it took place in Philadelphia last weekend, and though the series certainly qualifies as being international in nature, this was a night for the hometown boys. Let me say this from the start -- when considering the diversification and quality of talent which revolves through St. Mary's doors, the local kids would measure up -- and often surpass. 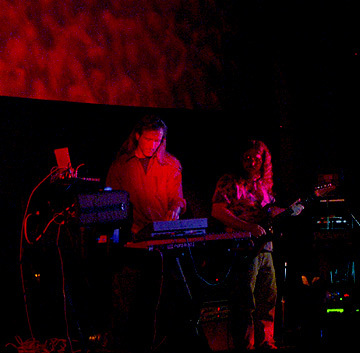 Terry Furber and Scott Watkins of Orbital Decay opened up with a bang and, to be blunt, never unbanged. I guess these guys rocked on for nearly an hour, and, considering my age and physical non-well being, I refused to stand on the pew and pulsate as did the lovely gal sitting next to me. Besides, I'd forgotten my respirator. 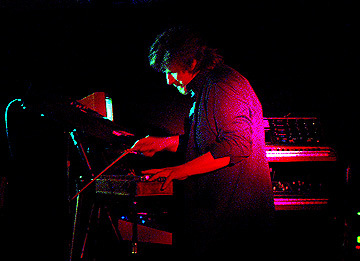 One gets the sense watching these guys perform that it's synthesist Terry Furber downing high doses of energy drinks, during both the musical creation process and live. 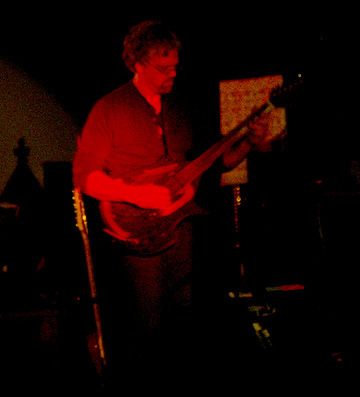 Scott Watkins perfectly complements Furber's analog-synth-based excursions, standing almost unnoticed at the side of the stage, offering essential atmospheric enhancements on electric guitar. 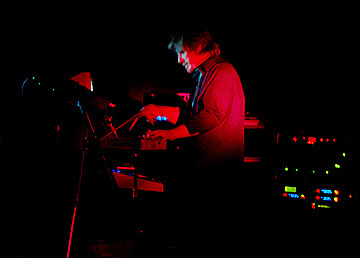 Furber, on the other hand, pulsates to the sequences, uses full body language adjusting the frequencies, and wiggles with utmost feeling while at the keyboard. This would be the most intense performance I've heard Orbital Decay offer, and I've seen several; a "go big or stay home" attitude was definitely brought to the stage. 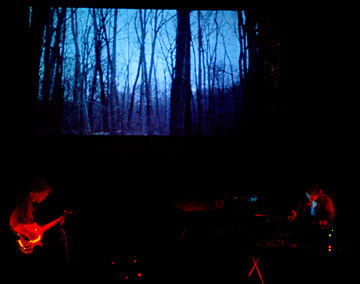 The visuals, too, were right on, rapid-fire, and trance conducive. Terry Furber produces Orbital Decay's live, onscreen display (a mixture of field photography, fractals and celestial images) with obvious careful planning and detail toward synchronization with the music. 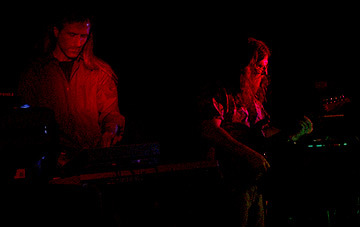 The second half of the evening belonged the other local guitar/synth duo -- Art Cohen (guitar) and Chuck van Zyl of The Ministry of Inside Things -- but the similarities between the two bands almost cease here. One would also rightly categorize both groups as Berlin-School based, but all it takes is an evening of Orbital Decay and MoIT to realize how broad a scope this type of music spans. I've been following the music of MoIT for many years now; in fact, the first Gatherings concert I attended -- back in 1996 -- featured MoIT (albeit sans Cohen, and with Peter Gulch). Their music has never ceased to challenge me. Challenges often bring rewards, and this has certainly been the case through the fascinating years of my circulating the area and attending MoIT concerts. Their concert last Saturday night was no less rewarding, and flat-out gorgeous. Most of the material was new (the exception being the opening piece), full of both finesse and highly sophisticated synth/guitar interplay. Watching the interaction, it makes a world of sense to hear that van Zyl and Cohen are lifelong friends. 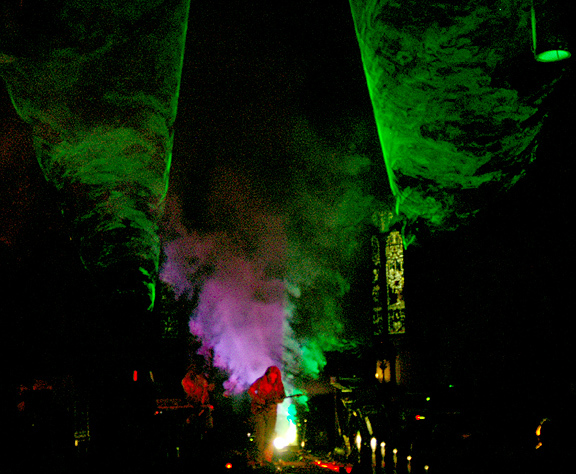 Unlike Orbital Decay's maintained level of ultra-intensity, peaks and valleys (sometimes deep, dark valleys) ruled the MoIT set, and this was all "marvelously" light-show enhanced by Jeff Towne's "hometown" utilization of the sanctuary's space. Lasers, flashing lights; these were intense when they needed to be, soft and lowkey when motions were settled. Eyes wandered the church, following the laser splashes, revelling the stained-glass windows, which were backlit by the living city, and beautiful. A lovely guitar solo by Cohen, distant and beautiful, in a form of expression I've never heard from Art before, with subtleties added by van Zyl, whisked the night away. 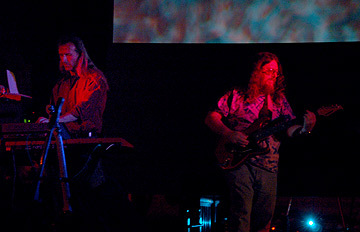 Both bands released new CDs this evening: Orbital Decay "Solar Maxima," and MoIT "Contact Point." 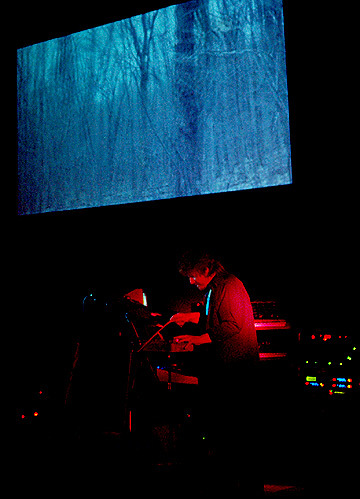 Terry Furber poignantly dedicated Orbital Decay's performance to his father, who passed away in April. A gorgeous, blustery afternoon turned into a calm evening on Locust Walk. The smell of fresh earth and blooming things filled the air - yes, in Philly! As dusk began to slide over Penn, the air was so still that one might hesitate to speak above a whisper. 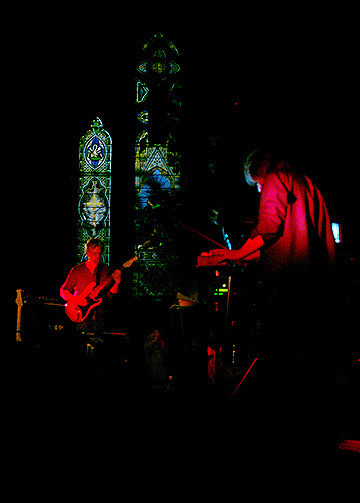 Inside St. Mary's church, the mood was as light and buoyant as the air outside as the Ministry of Inside Things and Orbital Decay ran through their sound check one more time. In the few years I've been coming to the Gatherings, I've seen for myself the tight-knit community these shows foster between fans and organizers, between performers and plebeians. The only other thing that maybe comes close in Philly are R5's show in the basement of the First Unitarian Church, but the Gatherings are thankfully devoid of sweaty young hipsters taking pulls at bottles of Twisted Tea in paper bags. Tonight, the celebration revolved around these four performers, all local figures, lynchpins of the Philadelphia space music scene. Gatherings number 62 would prove to be another success - in fact, the main attraction at this concert seemed to be everyone in the audience, all of us giving up a Saturday night to come bask in this otherworldly music and enjoy the close company of our fellow space travelers. After everyone settled in and heard some words of thanks from Chuck van Zyl, Terry Furber and Scott Watkins took the stage to play an opening hour. Having heard Orbital Decay live a few times before, I had known them to be well-informed in the ways of classic 70's space music and backed by an impressive collection of vintage musical gear. But at this Gathering, they laid out an hour's worth of original material that shot far beyond anything I was expecting, taking them into the realm of most excellent musical alchemists. 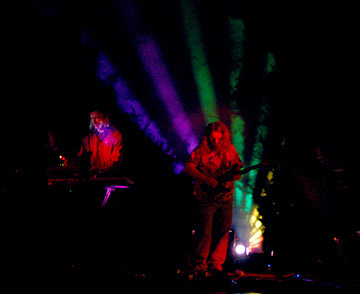 With a DVD projecting behind them, showing custom-made in-sync visualizations, and with darkness settling fully in during the eight-o-clock hour, the church glowed and pulsed in supremely psychedelic fashion. A classic Berlin school recipe was used - a foreboding atmospheric section opened up the first few minutes, followed by a barrage of huge booming sequences interlocked with fierce processed guitar work. 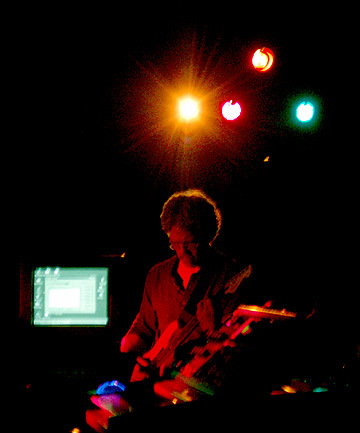 Terry moved from rack to rack, lost amidst all his gear, pressing, tweaking, tapping, going happily along in the flow. Scott reared back slightly on his feet while working his guitar, feet on pedals, fingers mashing the strings to make fat clouds of buzzing noise. Occasionally the two would exchange glances across the stage, but their set obviously bore the marks of careful work and preparation. The highly rhythmic pieces broke down several times in quiet contemplation, but this was only a temporary reprieve before the next sequence came bouncing into the mix. 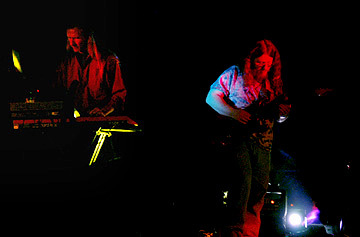 In the final movement of the set a bass pulse thudded in time to a spinning series of fractals on the screen above, while Terry and Scott soloed on top. A brief pause at the end of the set was marked by a message in memory of Terry's recently deceased father, after which the church erupted in delighted applause. "Retro?" I said to a friend of mine as he headed towards the back of the church. "Very retro," he said, and added a second later, "but damn good." Similar to Robert Rich's appearance at the church, the intermission was prime time for the gear trainspotters to rush the front of the church. Terry happily mingled and shared his knowledge with everyone who would listen, emphasizing once again the Gatherings' special bonhomie between performer and listener. That wave of good feeling would reach its peak when the Ministry Of Inside Things took the stage to celebrate the release of the new disc "Contact Point" and treat everyone to an hour's worth of brand-new material. With its origins in the 1990's and its influences reaching back to the psychedelic sounds of the 60's and 70's, the Ministry also made appearances at the very first Gatherings shows, long before they darkened the step of St. Mary's. This time, they unveiled a strange and diverse set, with Chuck and Art trading leads back and forth through a medley of different moods. 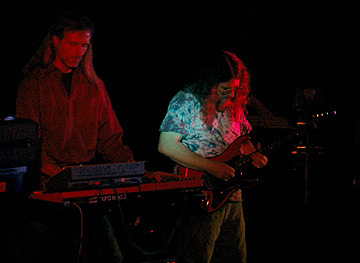 While not as fast and furious as Orbital Decay, the duo still showed off their knowledge well, aping a riff from Tangerine Dream's "Ricochet" for the opening salvo of "Rico-Dub". Interludes in the music came in the form of buzzing guitar feedback and long, echoing conversations captured on tape at 69th Street station. And most memorably, near the end, a pastoral lead melody from Art took hold over a slow, twanging bassline from Chuck, before melting away into future classic "Beloved". The church sat in blissful attentiveness - the keyboards put forth a harsh, steely atmosphere overtop of which Art played sparse, gorgeous notes with echo aplenty. 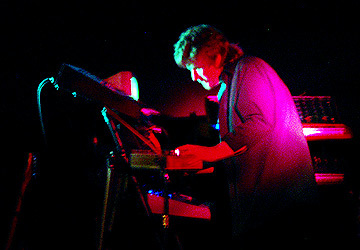 The whoops and applause were met with a brief encore - the tune "Fortescue" from the new album, with Jeff Towne's supreme lighting displays surging overhead while bubbling keyboard rhythms tussled back and forth. Many people lingered a little after the show, not quite ready to leave once the last note was played. 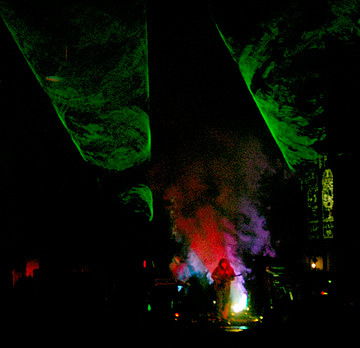 People shook hands with the performers, lounged in the pews, or stepped outside to tilt their head back to the earthy night sky which still blanketed the church with absolute stillness. Along with another couple hours of great music under the vaulted ceiling of the church, the Gatherings yet again lived up to its name as a haven of friendliness, quietude and musical companionship. To borrow a line from the shoegazing scene of the early 90's, it was just another night for "the scene that celebrates itself."